Hailing from a small village of Savusavu, Matelita Vuakoso has achieved a lot through football. At just 24, “Ma” as she is affectionately known, has represented her country on the international stage as goalkeeper for the Fijian national football team, is a senior instructor for the Just Play football program, a Commonwealth Sport for Development and Peace advocate, a wife and a mother. Growing up on a small Laucala village in Savusavu, when money was tight and girls were supposed to grow up to a life of housework, Matelita Vuakoso had her eyes on the horizon. “My father used to say; ‘that’s what she wants, I can’t stop her’,” she remembers. No one can stop her, it seems. A young girl runs in and is about to kick a football. Ma believes whatever she is today was through football. Success has come quickly, but not easily. “I come from a very poor background, where my parents financially struggled,” Ma explains. “I paid my school fees and try hard to support myself and to help my parents in bringing up my siblings,” she says. Ma dreamed of becoming a teacher but her dreams were shattered after she failed to win the scholarship. But as the only girl in Laucala Village who loved to play football, she emerged as the best young goalkeeper in the country and in 2014, after she featured for the Labasa women team and Labasa Muslim School team. 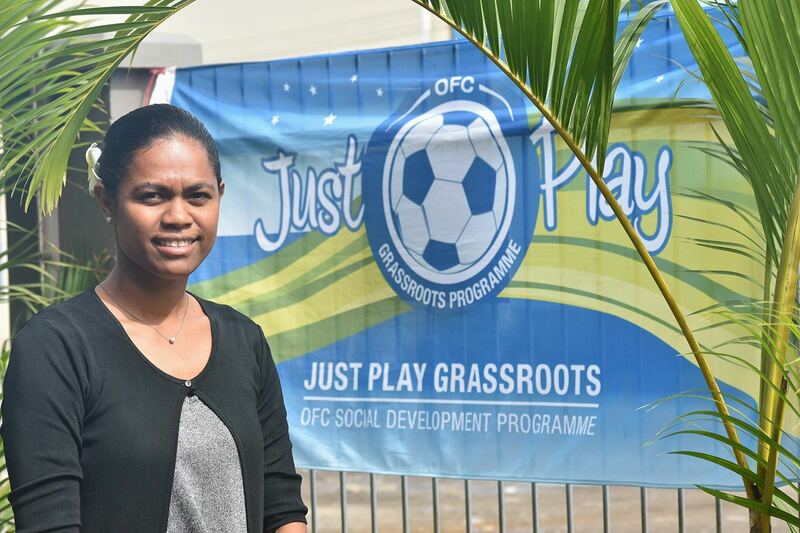 “I was than selected to play for my country during the South Pacific Games and OFC plays offs and I joined Fiji FA Just Play Programme as a volunteer. “All the doors started opening then,” she says. Now living in Suva after married to former national and Nasinu midfielder Ronald Ram, Ma has become a beacon for other young women in Fiji. “I always manage to keep my family, work and everything together,” she says. “Nobody should be left behind. “Whenever I do facilitating or travel to islands, I take my son along with me. “My father always emphasises that if you go through struggles, don’t waste time on it because it’ll take a lot of energy. “Put it down and take it as a stepping stone to the future and what you are looking forward to,” he would say. What she is looking forward to now is helping young Fijians balance modernisation and tradition and growing respect for women and girls through sport, specifically the Australian aid-supported Just Play program. Respect, first from her family and now her husband, has been vital to Ma’s success. “Other kids, when I was ten years old, they didn’t have shoes but my parents worked hard for me to have a bag and have shoes and they always taught me to be independent,” she recalls. And while the world may be calling on Ma’s magic, her mind is already on repaying a childhood debt by turning her family’s subsistence farm into an export business. If that ever happens, you can be certain Ma makes sure she isn’t the only girl in that village who gets to play football. “When I decided football was going to be my priority I had to invest everything to show that I had the right talent. It wasn’t easy, there were some tough moments growing up. You have to take responsibility and fight for certain things because your family can’t take on everything. “Football changed my life, my family’s life and many people’s lives. Thanks to football I have had success in my life and I can’t complain. She was also one of the speakers from Fiji during the 2018 Commonwealth Games debate forum “The Value of Sport: Maximising Opportunities in the Commonwealth’ and the third debate* on sport and sustainable development event. Ma spoke passionately that it was not about sport for sport sake, but it was how sport is used that delivers real impact. As the senior instructor for the Fiji FA ‘Just Play’ programme of the Oceania Football Confederation, Vuakoso, explained how the initiative promotes inclusion across Pacific countries by targeting people with disabilities to take part in mainstream community sport programmes.